The race for Seattle mayor is now over, with Jenny Durkan and Cary Moon advancing to the November General Election. On Tuesday, King County Elections certified the August 2017 Primary Election. Now that election results are final, we dived back into the data to see how Seattle neighborhoods voted for mayor. (See our updated map below, which now includes voter turnout.) A lot has changed since Election Night: Nikkita Oliver gained three more neighborhoods, and Moon won her first neighborhood. What hasn’t changed is Durkan’s lead in a majority of neighborhoods. She captured areas near downtown, such as Capitol Hill and Queen Anne, and communities to the north, including Ballard, Green Lake and Northgate. West Seattle and Delridge were the only neighborhoods the former U.S. attorney won south of downtown. She beat Oliver in Delridge by just 70 votes. Durkan won the most votes in Sand Point/Laurelhurst, followed by Magnolia. Former state lawmaker Jessyn Farrell trailed Durkan in neighborhoods including Lake City, Magnolia and Ravenna. Moon, an urban planner, beat Durkan in the Fremont/Wallingford area. Oliver won the most neighborhoods after Durkan. The attorney and educator dominated communities south of downtown where she bested Durkan in the Central Area and Rainier Valley. Oliver led state senator Bob Hasegawa in Beacon Hill, and she beat Moon in the Sodo/Georgetown area by just 66 votes. And in Capitol Hill, Oliver lost to second-place finisher Moon by just 17 votes. As for voter turnout, voters cast the most ballots in Sandpoint/Laurelhurst (48%). The lowest turnout was in the University District (25%). Overall voter turnout in Seattle was 40.5 percent. The primary election for Seattle mayor saw a record 21 people vying to be the city’s top elected official. According to preliminary results, more than 187,000 Seattle voters have cast a ballot in the primary, a 40 percent voter turnout rate. Jenny Durkan, a former U.S. attorney, and Cary Moon, an urban planner, have the most votes and are expected to advance to the General Election in November. Durkan leads with 27.9 percent of the vote, followed by Moon with 17.6 percent. Attorney and educator Nikkita Oliver is a close third, with 16.9 percent of the vote. Former state lawmaker Jessyn Farrell and state senator Bob Hasegawa are in fourth and fifth place. Now that we know which candidates are leading the race, we dived into the data to see how Seattle neighborhoods voted for mayor. Our talented geographic information system (GIS) team crunched the numbers from Election Night to determine the top two candidates in each neighborhood area. Check out our map below. Durkan won a vast a majority of neighborhoods, from Ballard, to West Seattle, to Rainier Valley. 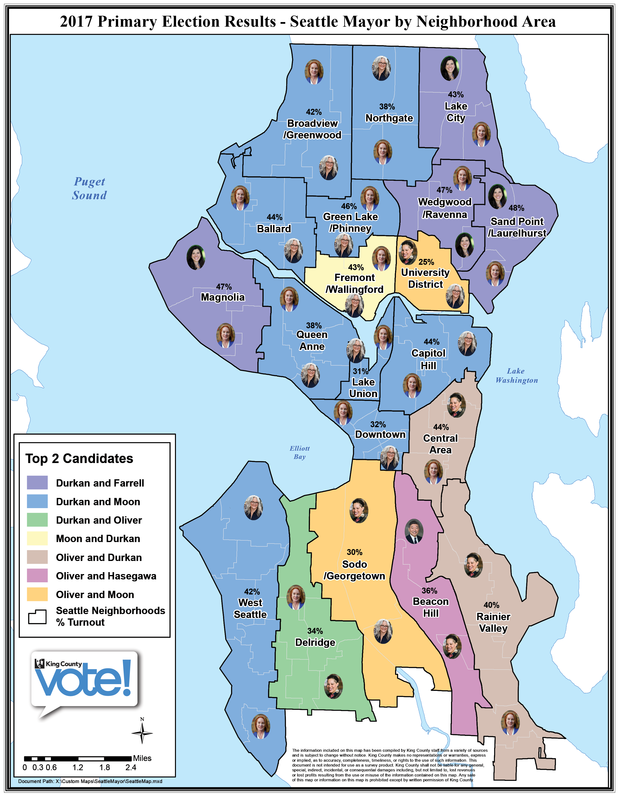 Moon was second to Durkan in Ballard, Green Lake, and neighborhoods closer to downtown, including Queen Anne, Lake Union and Capitol Hill. Farrell trailed Durkan in Lake City, Northgate and Wedgwood—all neighborhoods she represented as a state legislator. 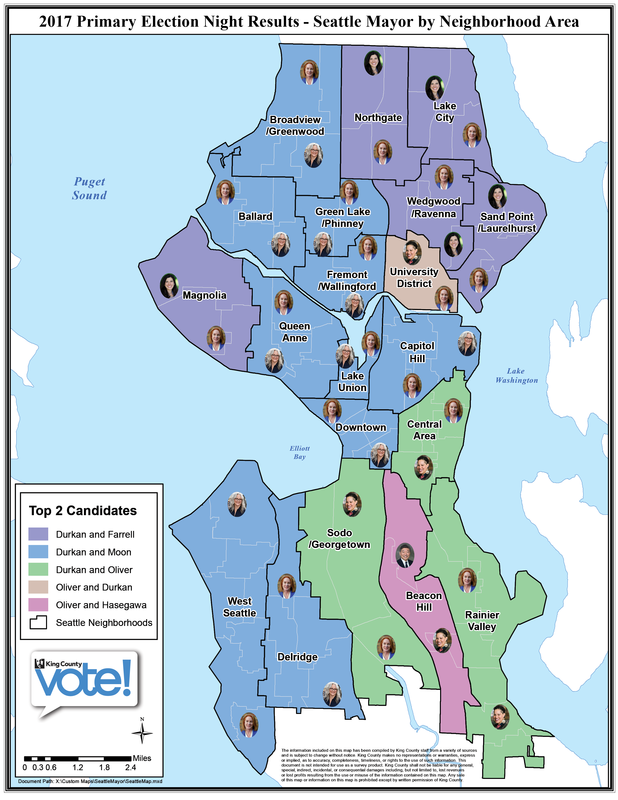 Oliver was the only candidate besides Durkan to carry an entire neighborhood. She beat Durkan in the University District and led Hasewaga in his hometown of Beacon Hill. Oliver trailed Durkan in the Central Area, Georgetown and Rainier Valley. Election results are preliminary and will be finalized when King County Elections certifies the primary on August 15. We’ll update the map should results change.